In its pursuit for economic development and human development in particular, Africa’s position relative to international systems is considerably weak. Poor performance of African countries is, in the main, brought on by social upheaval, political instability and a pervasive undermining of democratic regimes in favour of authoritarian ones. The causes of this state of affairs are numerous and multifaceted, originating from inside and outside Africa’s boundaries. Therein too rests the solution – from inside and outside Africa’s boarders. 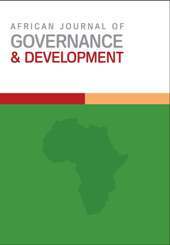 The articles in this issue of the African Journal of Governance and Development resonate with the all too familiar cliché “African solutions to African problems” and show how local solutions offer more effective and sustainable solutions to a diverse range of settings than those developed externally.